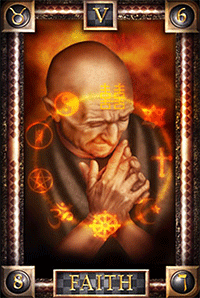 Your Self-Reflection Portrait is "THE HIEROPHANT"
The Hierophant as Taurus the Earthly bull may seem an odd sign for a holy man, but it makes sense if you understand that the Hierophant's purpose is to bring the spiritual down to Earth. Where the High Priestess between her two pillars deals with realms beyond this Earth, the Hierophant (or High Priest) deals with worldly problems. He is well suited to do this because, like all Taureans, he strives to create harmony and peace in the midst of a crisis. The Hierophant's only problem is that, like the Bull, he can be stubborn and hidebound. At his best, he is wise and soothing, at his worst, he is an unbending traditionalist. 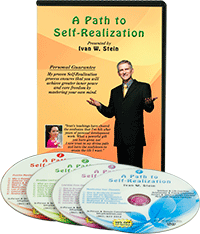 Your True Self Essence describes the powerful natural inclinations, talents and abilities that enable you to successfully accomplish and overcome any of the challenges you encounter in this incarnation. "You joyfully chose to enter this life with a highly progressive mindset and the attitude and skills to make the world a better place." Your Hearts Desire is the deep cry of your heart that longs to be satisfied. "Deep inside your heart is a desire to search for truth." Your Desired Destiny is your spiritual mission, your highest life purpose. "Your destiny is in self-expression. You are happiest when you are expressing love to your mate." Your Qualities of Mind: The words below represent the letters in your name. Duplications increase its strength. Your mind is characterized by the word "intellectual" and can be described as: intellectual, variable, active, versatile. Your inner motivation is characterized by the word "willing" and can be described as: willing, intellectual, vital, vital, active, hard working. Your executive abilities are characterized by the word "strong" and can be described as: willing, intellectual, vital, vital, active, hard working. Your American Indian Sign is "Goose"
The animal symbolism of the goose hasn't got its full honor. Too often in myth and lore we see the goose representing silly attitudes or lazy dispositions. On the contrary, the symbolism of the goose is quite inspiring. When we consider the goose never leaves one of its own kind behind, we begin to see the goose in a different light. Just like the US Marines, "Semper Fidelis" (always faithful) is the motto of the goose too. Geese annually migrate to warmer climates during the winter. Should a goose become injured during this trek, another goose will leave the migrating flock to stay with its fallen comrade. The goose will stay with the injured until he has recovered or until its final breath. Nothing silly about that. Indeed, this kind of valor puts the symbolism of the goose in a far different light. Check out some symbolic attributes of the goose to get a more clear understanding of what this amazing creature can offer in wisdom. Geese are incredibly gifted navigators and instinctively know the way across the long haul to warmer climates. They forge ahead with confidence and bravery. Further, geese have intricate methods of communication - not only do they sense when their brethren are in trouble, they also work as a team to communicate warnings, as well as messages of prime landing sites. Geese are also fiercely protective of their young - often presenting an impressive thrashing display to would-be predators. These scare tactics often work to protect goslings from attack. Those who have the goose as their animal totem need not worry if they are silly or lazy. This is far from the truth. In actuality, those who are kind, loyal, and brave-hearted attract geese as their totem. Those with the goose totem are the clear communicators, true-blue defenders and compassionate keepers of the community. Remember your roots - don't forget the people who helped you along the way. Follow your gut - rely on intuition and instinct in order to get where you need to be. Communicate your needs to others - no one can help you if you don't speak out. Protect that which is most valuable, but make sure you have your priorities straight (meaning, be sure you're protecting that which is worth protecting). The energy of Yellow Star may be experienced as a gentle rocking that becomes a floating and spiraling sensation, ending in a rush of feeling as you move into expanded reality. This sensation has been described as gently cascading fireworks, shimmering burst on the tapestry of Creation. Cascade into this uncharted perspective. Flow on the cosmic winds wherever Divinity directs, arching back to this reality with a new experience of self. Unlike the preceding 7 tones, which were separate and distinct, Yellow Star begins a more complex harmonic series as it completes the preceding octave. 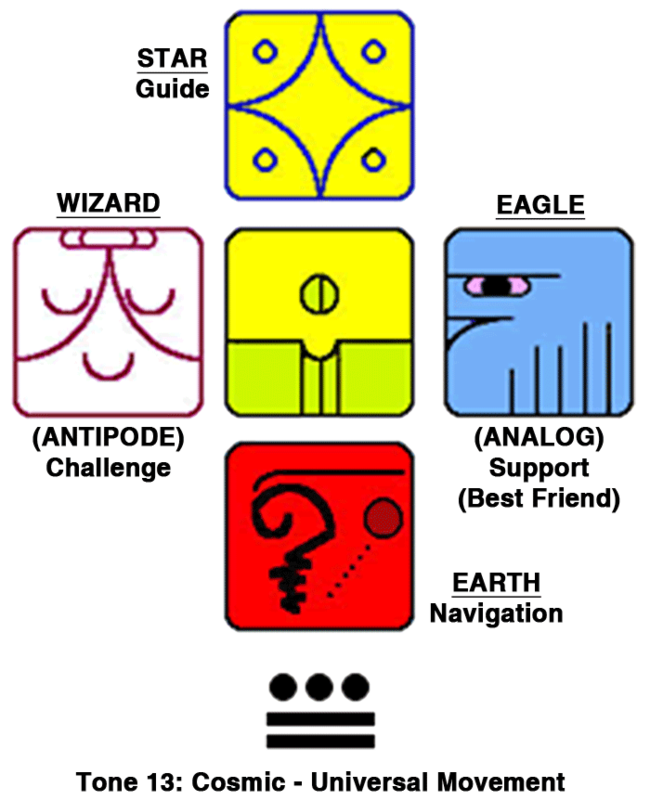 On a spiritual level, Yellow Star begins the development of higher being. The fundamental tones that occur in this series are of a more expanded frequency than those of the preceding seven tones. In this new octave, there is alignment in the harmonies of Earth and the harmonies of the stars that are now being sounded on Earth. Yellow Star is the first in a series of star harmonies that evoke accelerated growth of the starseed potential within you. 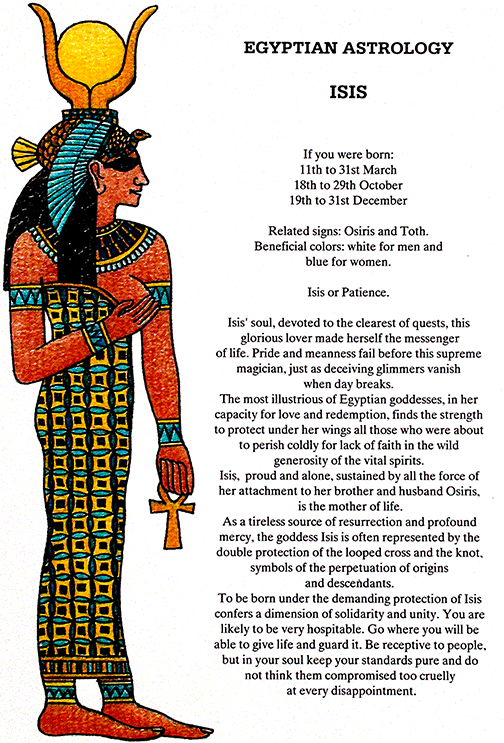 Your Egyptian Sign is "ISIS"
Isis' soul, devoted to the clearest of quests, this glorious lover made herself the messenger of life. Pride and meanness fail before this supreme magician, just as deceiving glimmers vanish when day breaks. The most illustrious of Egyptian goddesses, in her capacity for love and redemption, finds the strength to protect under her wings all those who were about to perish coldly for lack of faith in the wild generosity of the vital spirits. Isis, proud and alone, sustained by all the force of her attachment to her brother and husband Osiris, is the mother of life. 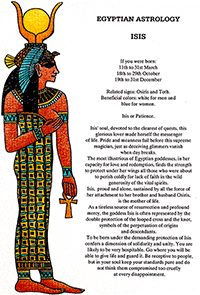 As a tireless source of resurrection and profound mercy, the goddess Isis is often represented by the double protection of the looped cross and the knot, symbols of the perpetuation of origins and descendants. To be born under the demanding protection of Isis confers a dimension of solidarity and unity. You are likely to be very hospitable. Go where you will be able to give life and guard it. Be receptive to people, but in your soul keep your standards pure and do not think them compromised too cruelly at every disappointment. 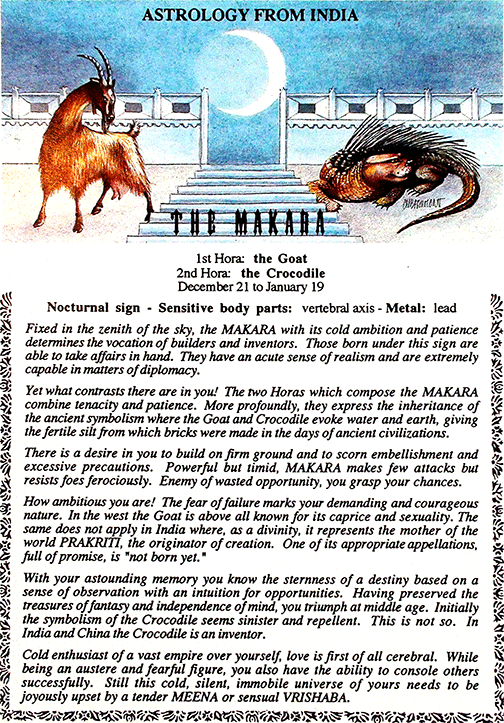 Fixed in the zenith of the sky, the MAKARA with its cold ambition and patience determines the vocation of builders and inventors. Those born under this sign are able to take affairs in hand. They have an acute sense of realism and are extremely capable in manners of diplomacy. Yet what contrasts there are in you! 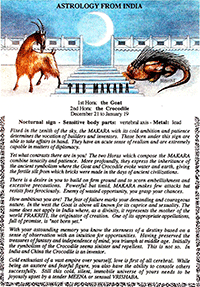 The two Horas which compose the MAKARA combine tenacity and patience. More profoundly, they express the inheritance of the ancient symbolism where the Goat and Crocodile evoke water and earth, giving the fertile silt from which bricks were made in the days of ancient civilizations. There is a desire in you to build on firm ground and to scorn embellishment and excessive precautions. Powerful but timid, MAKARA makes few attacks but resists foes ferociously. Enemy of wasted opportunity, you grasp your chances. How ambitious you are! The fear of failure marks your demanding and courageous nature. In the west the Goat is above all known for its caprice and sexuality. The same does not apply in India where, as a divinity, it represents the mother of the world PRAKRITI, the originator of creation. One of its appropriate appellations, full of promise, is "not born yet." With your astounding memory you know the sternness of a destiny based on a sense of observation with an intuition for opportunities. Having preserved the treasures of fantasy and independence of mind, you triumph at middle age. Initially the symbolism of the Crocodile seems sinister and repellent. This is not so. In India and China the Crocodile is an inventor. Cold enthusiast of a vast empire over yourself, love is first of all cerebral. While being an austere and fearful figure, you also have the ability to console others successfully. Still this cold, silent, immobile universe of yours needs to be joyously upset by a tender MEENA or sensual VRISHABA. Your Aztec Sign is "THE CAYMAN"
For all the peoples of ancient Mexico... our Mother Earth was born out of The Cayman who lived among the waves at the beginnings of time. 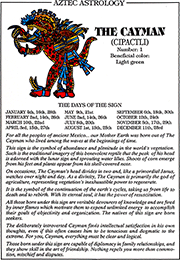 This sign is the symbol of abundance and plenitude in the world's vegetation. Such is the traditional imagery of this benevolent reptile that the peak of his head is adorned with the lunar sign and sprouting water lilies. Shoots of corn emerge from his feet and plants appear from his shell-covered nose. On occasions, The Cayman's head divides in two and, like a primordial Janus, watches over night and day. As a divinity, The Cayman is primarily the god of agriculture, representing vegetation's inexhaustible power to regenerate. It is the symbol of the continuation of the earth's cycles, taking us from life to death and to rebirth. With its eternal soul, it has the power of resuscitation. 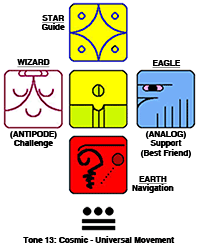 All those born under this sign are veritable devourers of knowledge and are fired by inner flames which motivate them to expend unlimited energy to accomplish their goals of objectivity and organization. The natives of this sign are born seekers. The deliberately introverted Cayman finds intellectual satisfaction in his own thoughts, even if this often causes him to be tenacious and dogmatic to the extreme. For you, Cayman, everything must be clear and Logical. Those born under this sign are capable of diplomacy in family relationships, and they show skill in the art of friendship. Nothing repels you more than commotion, mischief and disputes.